In the absence of humans, global sea level might have dropped a smidge last century, according to a detailed analysis of our past and future climate published today in the Proceedings of the National Academies of Sciences. 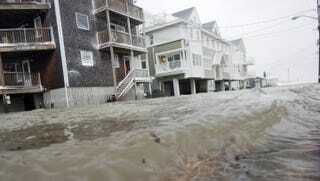 Instead, sea level rose about 5.5 inches—faster than it has in at least 27 centuries. “The 20th century rise was extraordinary in the context of the last three millennia,” Robert Kopp, an Earth scientist at Rutgers and lead author on the new study, said in a statement. While many researchers have used models of the past to demonstrate the rapid swell of Earth’s tides in modern times, Kopp’s study is the first to draw on detailed geologic records from dozens of locales worldwide. The present, he can confirm, is historically weird. And that weirdness is almost certainly due to industrial society. After developing statistical models of the relationship between temperature and sea level based on geologic records, Kopp and his colleagues decided to see what an alternate history would look like. They examined two models of the 20th century: one in which temperatures hovered around the 500 to 1800 AD average, and another in which a slight pre-industrial cooling trend continued. Kopp’s study also adds to the mounting pile of scientific evidence that the world’s coastlines are in store for a lot more sea level rise—1.7 to 4.3 feet this century, if we continue pumping carbon into the air unabated. If that’s the case, a water-logged Miami will be the tip of the proverbial iceberg. The message? Policy makers can no longer in good conscience ignore the threat of rising tides when planning for the future, given the trillions of dollars worth of infrastructure (not to mention human lives) at risk. In response to Hurricane Sandy, the Obama administration issued an executive order that future flood risk be factored into building standards for federally-funded construction projects. But for cities, towns, and even spaceports on the front lines, a much more comprehensive mitigation effort will be needed.